The NLSY79 is a nationally representative sample of men and women who were ages 14 to 22 when they were first interviewed in 1979. Respondents were interviewed annually until 1994, and since then they have continued to be interviewed on a biennial basis. The NLSY79 collects detailed information on fertility, marital transitions, and employment in a format that allows one to determine the dating of the specific events. The data I reviewed were collected through 2010, so the sample members ranged in age from 45-53. The focus of the data collected by the BLS, and which I reviewed, was marriage and divorce, and the data were broken down by ethnicity, age, gender, etc. I was particularly struck by the trends related to educational level. 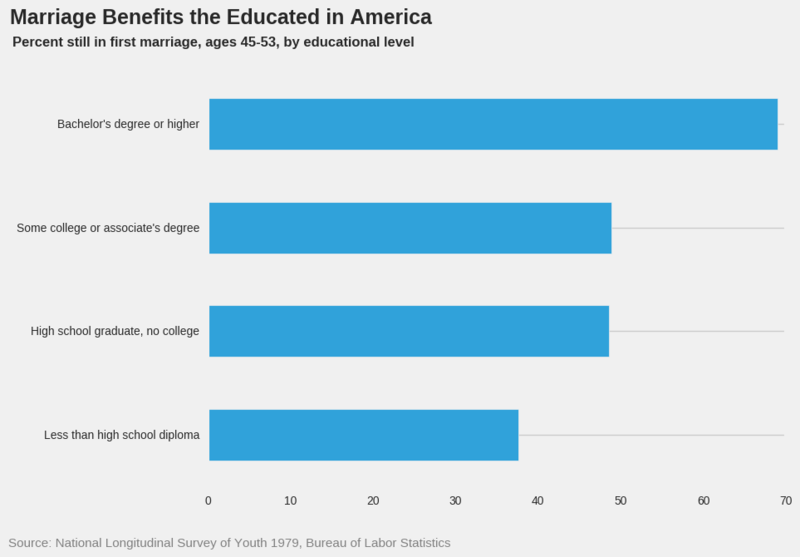 First off, while there isn’t much separation between varying educational levels, the percentage of those ever marrying was slightly higher for those with higher educational levels. What is particularly striking is the effect of education on whether a person experienced divorce. Those with higher educational levels also wait until later in life to marry. 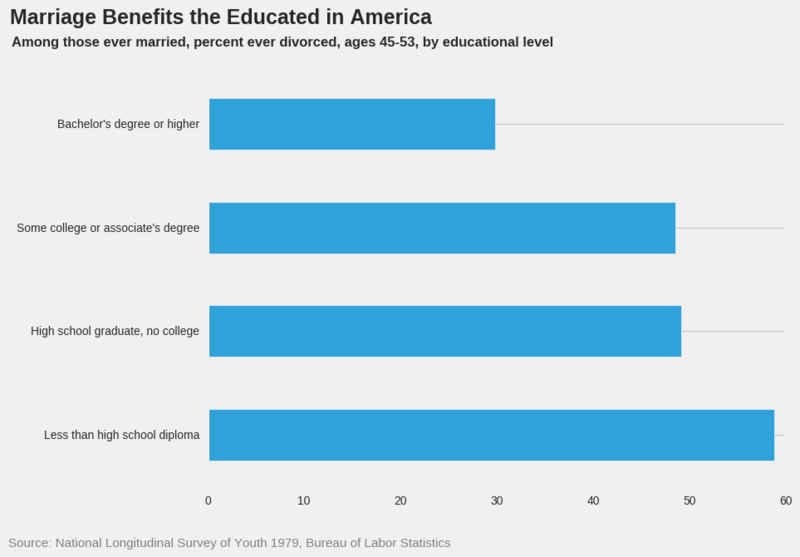 Why do higher educational levels correlate with lower percentages of divorce? Does marrying later in life provide advantages to avoiding divorce? Can we infer that higher income levels also help fend off divorce? 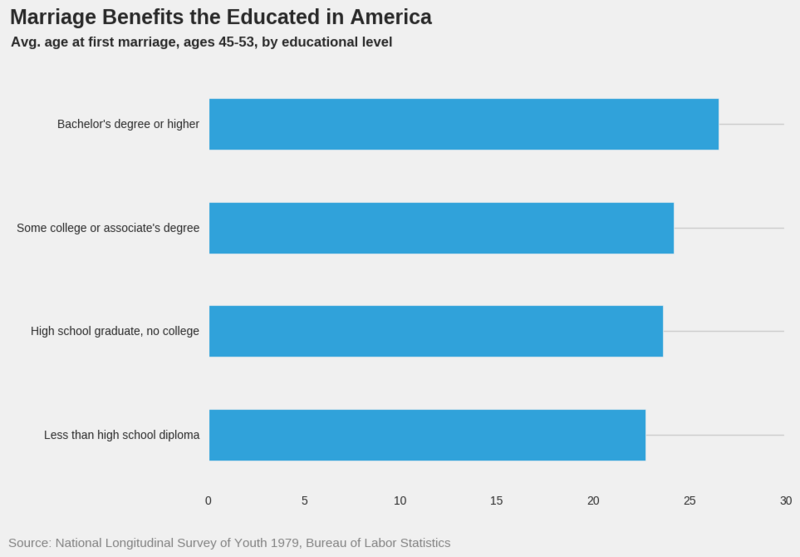 Why does educational level affect whether one marries at all? How, in light of these findings, do you view the advice of Church leaders to marry early? In my opinion, it’s a simple matter of experience when it comes to marrying later, especially with the 1st study being in 1979. Older people know more about themselves; what they want; and what they can and cannot tolerate in a partner. It stands to reason that they’d be more successful in their marriages. And the education level ties right into that due to them being a bit more focused upon it than on dating / marrying. Then you can add in less external stress among the more educated. They’re more likely to be more financially secure and avoid some of the strongest stressers on a relationship. Of course, that is only to a point. The more wealthy see, if I remember correctly, a dip in marriage success rates, largely due to being TOO focused on careers and ignoring the needs of the relationship. Most of the push on the advice came during the Vietnam war when marriage was a block to the draft. There were other statistical differences as well. But, in a world where divorce is easy and there are other issues, lots of things change. 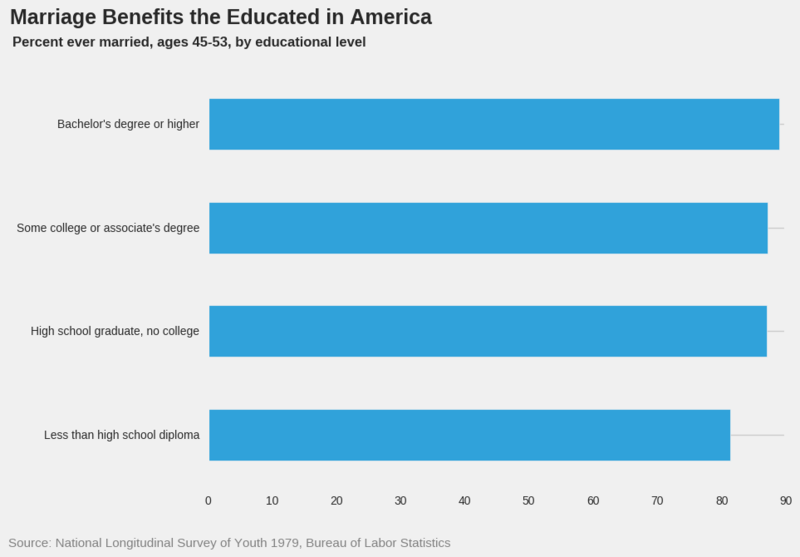 In addition, education creates ties in common and is also a social class marker. That is much starker in the younger age cohort studies. I suspect that the social class issues are the stronger factor. So. Certain social classes are much more likely to get married and less likely to get divorced. Just realized that in the office I work in, the attorneys have a single divorce between them and the one who divorced had real tragedies of the sort that often lead to divorce. It may have to do with money. Bad finances often cause bad marriages. Higher education generally leads to higher incomes. LDS youth seem to be marrying older than they have in the past. While still young compared to other categories I think we’ll see these same trends among the LDS. I do wonder how much of this is an American phenomenon. Good stuff Cody. One of the more disturbing aspects of church history from 1845-1906 was how easy it was to get divorced and how often it was even encouraged. I think that you error in your assumption that even today successful marriages are a top priority. This isn’t meant as a dig to the leaders, but the more important correlations they would be looking at would be retention rate/age of marriage, retention rate/ever married, retention rate/length of time between marriage and first child birth. I do believe that the LOC and protecting virtue also play a role in their counsel to marry early. I would be interested in knowing how many bishops and stake presidents in the last 15 years have encouraged divorce after one spouse has a faith crisis and leaves the church. I would wager in private conversations with the majority of the Q15 if a grandchild presented them with a situation where they could either remain married to a spouse who no longer believed or find someone else who could take them to the CK, the advice would be to divorce. It seems that college education, financial stability, IQ, socio-economic background, and other factors all correlate with getting married and maintaining a stable marriage. A commitment to improving interpersonal relationships, especially marriage, and problem solving skills are probably some of the learned behaviors that correlate with the above tested qualities and lead to improved marriage. I have noticed a lot of conference talks about general interpersonal relationships, service to others, and getting personal revelation for problem solving. Plenty of pro-marriage talks, that may not include the word marriage, spouse, or other synonym. What this says to me is marriage is becoming a privilege of the comfortable classes. A lot of research has come out the last few years that underscores this. Marriage is most successful when it is between two people with similar resources/training/experience/etc. They don’t have to be wealthy, but they need to have a roughly equal position within the marriage. Women with less financial abundance have chosen to have children, but not marry, as marriage means giving a man (often with less earning potential) lifelong ties to her money and legal leverage over her children. It’s a catch-22 for a lot of these women – marriage should bring various forms of stability, but marriage with men in their class looks more fraught with potential pitfalls and instability (http://www.nber.org/papers/w23408). Investing in educational and training opportunities and living-wage jobs for blue-collar men and women would be the best way to support healthy, long-lasting marriages. I’ve read a number of times recently that economists/sociologists are saying that the number one predictor of life outcome (including such things of salary, college education, marital stability, etc.) is the life outcome (salary, education, marital stability) of the biological parents. Although it’s a dangerous slope (towards widespread discrimination on a number of levels), I don’t k now that it does any good to deny that genetics plays a huge role in all this. ReTx: I’m not so sure the advantage is genetic as it is opportunistic. More highly educated, stable parents can invest in their children in greater ways than others can. They also have professional and social connections that can be leveraged. I agree with Cody, ReTx. Coming from a stable situation is more likely to create a stable situation, and coming from an unstable situation is more likely to lead to another unstable situation. That’s why I’m disinclined to believe that the church’s counsel to marry young(er) is wrong, or is necessarily more likely to result in divorce (depending on what one means by “young”). If Mormon kids come from more stable situations on average, then you’d expect them to do better on average. If they come from an unstable situation, then maybe marrying later improves their odds. Also, I think the soft skills necessary to complete higher education (eg., resilience, ability to look at things from different angles, take criticism, cooperate, follow though, etc.) correlate well to the soft skills necessary to have a successful marriage. Thus, I don’t think education itself may not have much to do with cause – it just correlates well. No you are misunderstanding me. The research was done on adopted children to separate out the ‘nurture’ factor. So adopted children’s outcomes corresponded to their biological parent’s outcomes, not their adoptive parent’s outcomes. If I had more time, I’d hunt around for where I read this stuff. It was super interesting. Some of it was in ‘The Blank Slate’ (an imperfect, but interesting book). I think the Freakonomics guys did a podcast on it as well. But there was something else I read that really got me thinking, that I can remember. I have also seen the study that ReTx cites. If this is accurate and adopted children’s life outcomes correlate more closely with their biological parent’s than their adoptive parents, then the answer to 2 of the OP questions are fairly clear. Q: Does marrying later in life cause better marriage outcomes? A: No, it is correlated to them, but does not cause better marriages. Q: How should we view the advice of church leaders to marry early? A: It is good advice, once an individual feels prepared for marriage. Putting it off to finish education first, should not be a long term problem. The root causes of good marriages and divorce are not marriage age (23 or 28 are both mature enough for marriage, in general). Unfortunately, the mutable root causes of divorce are mostly a general culture issue that general authorities are unlikely to change in a major way. They can have some impact on and individual level, so there is some hope that the message has impact.